Laphroaig distillery was founded in 1815 by Donald and Alexander Johnston and is located in Port Ellen, Isle of Islay. Although Laphroaig isn't allowed to put the prefix ‘Royal’ in its name (yet), rumor has it his royal prince Charles of Wales is a fan of the ‘L’ Whisky. The 15-year-old is reportedly the prince's favorite Scotch. For a long while there’s been frenzy for Laphroaig’s Scotch, especially those less-available expressions. 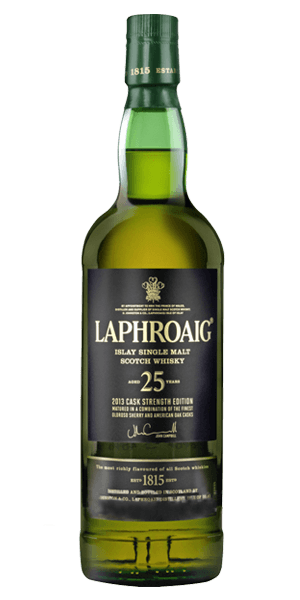 Laphroaig 25 Year Old is an interesting flavor fusion of Sherried, oaky flavors from the European Oloroso Sherry casks and the creamy, smooth, sweet flavors from the American Bourbon barrels. Two most different maturation flavors come together here, made smoother by the 25 years it has had for gentle maturation. What does Laphroaig 25 Year Old Cask Strength taste like? The Flavour Spiral™ shows the most common flavours that you'll taste in Laphroaig 25 Year Old Cask Strength and gives you a chance to have a taste of it before actually tasting it. Driftwood, sea air, old ropes, beeswax, honeycomb, iodine, malt, Sherry. Peat, Sherry sweetness, apple fruitness, coastal, tar treacle, iodine and seaweed. As long as the Titanic. This is by far my favorite whiskey. It blossoms incredibly strongly, in contrast to the (relative to other peaty whiskeys) subtle flavors when you allow it to sit on your tongue. When I first began to taste it, I barely believed it was a Laphraoig! Smokey, a bit rough – so far the best Whisky I've ever tasted. So sweet and with a lot of character. Incredible flavors!!!! It's a well balanced but peated piece of gold. My favourite peaty whiskey, love it.